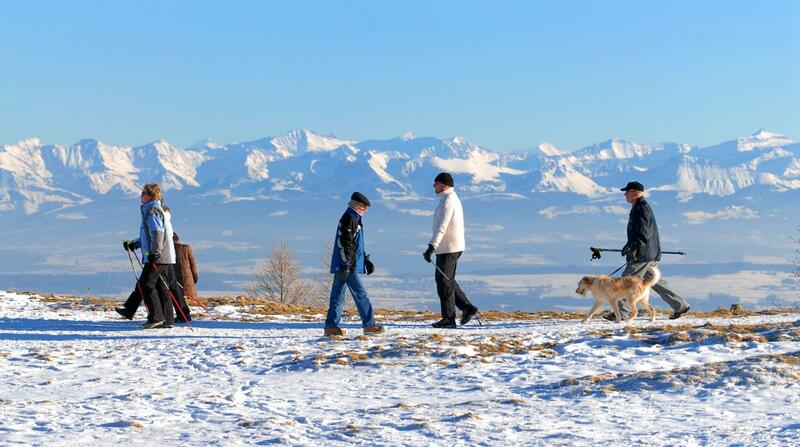 Well distributed between the Vaudois Alps, the Jura Vaudois and even above Montreux, the 10 Vaudois winter walking trails that have been integrated in the SuisseMobile network invite walkers to active relaxation in a soothing winter landscape. Located in the Vaudois Alps – Villars, Les Diablerets, Leysin and Les Mosses –, in Vallée de Joux in the Vaudois Jura, in Sainte-Croix and Saint-Cergue as well as in Caux above Montreux, the existing trails chosen by SuisseMobile range from a lovely winter walk to a more athletic hike. The longest trail - a loop departing from Hostellerie de Caux - totals 11 km and a difference in height of 680 m. This trail of medium difficulty lets hikers discover this sometimes-overlooked region above Montreux and offers a panoramic view of Lake Geneva and the Alps. Among the other 9 trails, hikers have the choice between paths ranging from 2 to 9 km in length and 30 to 330 m in difference in height. Following the philosophy of SuisseMobile, the purpose of this integration is to promote soft mobility in all seasons and to provide all the conditions to ensure a perfect organisation and smooth hike, regardless of participants’ physical level.